When I login to the dashboard and add a new post. Then try uploading an image to set as a featured image, I get a red box with a message "HTTP Error". I have read about people saying to not use the flash uploader and just use the browser uploader, but when I try that, I just get a 500 Internal Server Error. I have tried adding AddType x-mapp-php5 .php at the top of my .htaccess file, with no luck in change. Disabling ALL plugins had no effect. I tried a fresh install. No luck. Update 10/17/2016 - If you're using custom roles or capabilities, please try using a native role/capabilities and try again. If you're operating behind a proxy, be sure you have your proxy server timeouts configured correctly. I put the following code into my functions.php file. It works! When this helps it is because it changes the php code module used for processing the uploaded image for use with Wordpress. This processing includes moving the image into the Media Library database and generating the different size images ("thumbnail", "medium", "large") that Wordpress always wants available for Themes to access. It causes the "GD" module to be used, because it is first. In some server setups, the newer "Imagick" library isn't playing well with others for certain image scenarios, such as large pixel dimensions, so forcing the "GD" library to be used is a fix. After troubleshooting with @Wyck in chat, we have narrowed to the underlying issue. The issue was related to my server configuration not having the proper amount of memory allocated to Apache/PHP. If the above solution does not work, read this article (Image/Media Uploader problems?) for further trouble shooting. try adding one by one or all of the following .htaccess tweaks to the .htaccess file in the root directory of your WordPress installation. Seriously, try one of each of the solutions below so you know which one did the trick. Don't just paste them all in your .htaccess file immediately. If you're using Access Control based on Authentication on your Webserver (often known as htpasswd, Basic Authentiaction, password protected directory or similar), WordPress is not able to handle it for Flash Uploader, Cron and XMLRPC. Related files need to be excluded to work. Keep in mind that this might break your security considerations. One final note: some have said that if using a lesser version of PHP 5.3.X you can try disabling PHP Safe Mode. 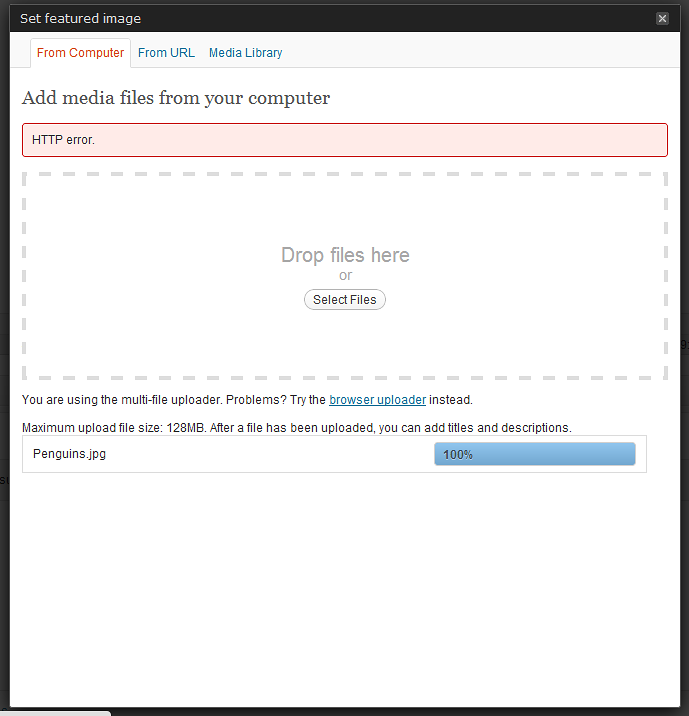 If you are running WordPress multi-site and are receiving HTTP errors or Internal Server errors, related to image uploading, please read Uploading Images to Multi-Site Causes Failure to HTTP Error for other possible trouble shooting ideas and solutions. I ran into the same error, when trying to upload media in wordpress. In Chrome, it shows up as a http: error; in Firefox, the error looks quite different. The web is full stories of people who have spent days to chase the bug (so have I :-( ). Solutions abound, but nobody explains why, at least not in a way that is consistent with the symptoms. My tuppence worthy contribution: I noticed that the problem correlates with a segmentation fault signalled in the log file of apache2. That disturbs me, because it is difficult to diagnose. I have resolved this issue by changing my owner from root to apache as below. after that i have tried to upload image in the media i was successful to upload the image. This helped with the HTTP Error / the 500 error but thumbnails were no longer being generated. I then deactivated the plugin again and what then helped me was this answer on the question Looks like image resize is not working well. My PHP_MEMORY_LIMIT was set to 160MB which is the absolute maximum my hoster allows. For uploading images this resulted in maximum possible dimensions of the image of around 6000 x 6000 px when using PHP GD and generating thumbnails. So it's important to not only check the file size but also the dimensions of the image. Uploading an image with higher dimensions resulted in an HTTP Error / error 500 even with small file sizes. Not the answer you're looking for? Browse other questions tagged post-thumbnails uploads attachments media media-library or ask your own question. HTTP Error When Uploading Images with HTTPS?